Where is the Money for the Border Fence? In Iraq, No Doubt. Another reason to hate Bush. 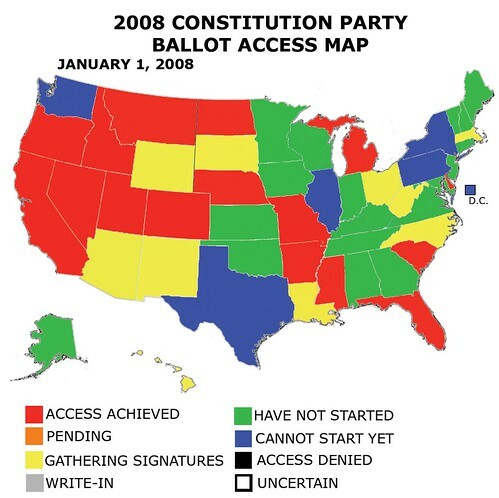 Tomorrow, with the posting of the February 1st ballot access chart at Ballot Access News, I will be posting a ballot access map for all of the major third parties. Richard Winger has told me that he is okay with my doing this (I will be doing it using the information that is already available online, not the information from the hardcopy newsletter, so it will be a month late). In any case, you want the latest data, subscribe to Ballot Access News. I did, and it was worth it. As we all know, courts are the best qualified groups for determining scientific questions. No need for those pesky studies, or for actual non-anecdotal data. Now, maybe there is more to this, I'll admit that I have not read through this paper very carefully, but at first blush it appears that courts took sympathy on a family with an autistic child, made an emotional decision, and people who are suspicious of vaccines are looking at this as if it were somehow scientifically significant. thanx and a tip o' the hat to WorldNetDaily. Is the primary purpose of getting a kid a "good education" really about improving aptitude (I'm assuming that Cochran is talking more about aptitude tests than tests of knowledge) test scores and getting him a higher paying job? If that is the case, yes, innate ability generally seems to be a much more important factor. However, are there other benefits to having a "good education," such as a happier time in school, perhaps a better knowledge of culture and literature, and the like? Is the quality of education really unimportant to quality of life, or is it just that it does not create the material benefits that many people assume is its primary goal? The thing that troubles me about Cochran's observations is the question of how far can you take the "innate ability thing" before how you treat a kid actually has consequences? Could we just stop all education and let all of the kids run wild? Could we lock them all up in closets for the first eighteen years? Is there any point in caring for our kids at all? Or is it just that virtually every kid in the U.S. receives the minimum level of care before the marginal returns on extra care diminsih to near-zero? Because if it were not for my getting interested in AntiWar.com back during the 2000 Presidential Race, I might have become a war hawk after 9/11. McCain must be defeated, even if it the result is a Democrat in the White House (although I would not vote for the Democrat). If Ron Paul loses the primary for his Congressional seat, I would not be opposed to him running to retain it as an independent or as a third=party candidate, provided that he is able to do this (I don't know if Texas has "sore loser laws"). If he can't, maybe one of his children can run in his place. Alternately, I would not be against him changing his mind on his decision not to run for President if he loses the Congressional nomination, although if he can retain his Congressional seat then he ought not to run. In any case, if his opponent wins I'll probably send money to whoever the Democrat is running for that district (unless Paul runs third party), just to spite that little SOB Peden. I may get similarly involved in the race for Gilchrest's old seat, too. Paul Craig Roberts on an alternate explanation for the decrease in violence. In one week, Antiwar.com raised 55.48% of its goals. I've already donated $100.00, plus my $15.00 a month. We need to pick up the pace! If you can spare some cash, please donate today. (I am currently pledging $15.00 a month automatically). Go to Paul's Congressional campaign website and click on "Contribute!" to make certain that he is well-funded for the primary to retain his House seat. Contributions to the Constitution Party will help them get on the ballot in more states. Note: There is an error in here. Missouri ought to be orange, not red, as the petitioning is finished but the CP has not officially been given access yet. Thanx and a tip o' the hat to Ballot Access News. Featuring Paul, Huckabee, Obama, and Clinton.